Okay, so. Let me start by saying I love French manicures. I AM half French. 🙂 They are simple, classy, elegant, and ageless. They will NEVER go out of style, and you can wear them with anything! Anytime, anywhere. They’re just THAT versatile. So, I painted my nails a French manicure the other day and took a bunch of pictures. I always take like 20 pictures of my nails and then only post 1 or 2. I don’t want to just fill the blog with photos, no matter how fun that sounds. 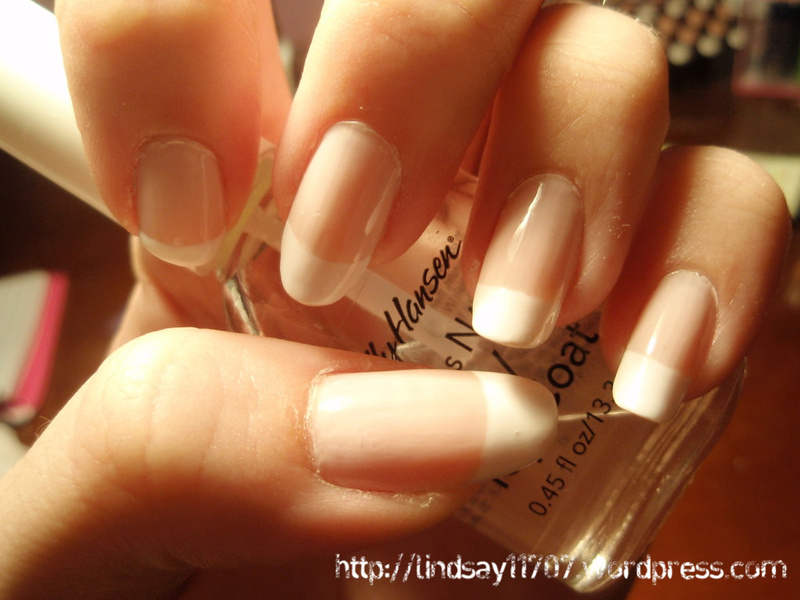 But I might do that with this post, considering that most people know how to do a French manicure, so there’s no need to explain how I did it. But I’ll still tell you what I used. 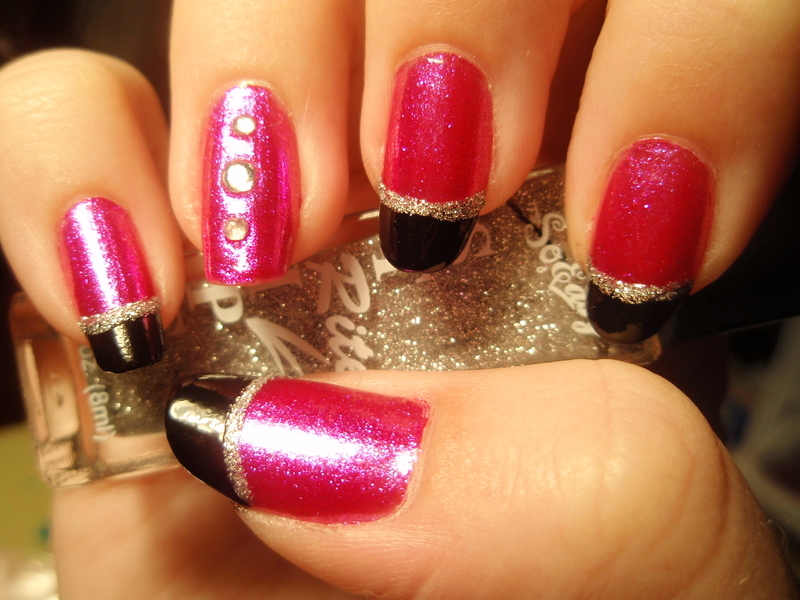 I used “Sweet Blush” by Orly for the base, and China Glaze’s “White on White” for the tips. Now, “Sweet Blush” is a great nail polish, it goes on really smooth, but it is not for everyone. “Sweet Blush” matches MY skin tone pretty well, but it may not match yours. But don’t fret! Orly’s French manicure polishes has a bunch of different pink colors. 🙂 And the “White on White” is just a simple white. Any white polish will do. Some people will use the stickers for the tips, to make a perfectly curved line. I, on the other hand, do not use them. I’ve tried it a few times, and it’s fine, but I just prefer doing it myself. Photo time! Here are pictures of my left hand. Unfortunately, my pointer finger nail broke, so it’s a lot shorter than the rest of my nails. But I REFUSE to cut my other nails to match. So I just have to wait for it to grow out. And here’s a photo of my right hand. And the pointer finger nail on this hand ALSO broke, but not as short as my left hand, thankfully. So, yeah, for some reason, it’s ALWAYS, ALWAYS, ALWAYS the pointer finger nail that breaks. A close up of the rhinestones. Ignore the fact that my finger looks wrinkly. Thank you. Polish Hoarder Disorder just had a Design Challenge called “Just Tips” which means that you have to create a nail design using just the tips of your nails. So basically, it’s supposed to be a funky French manicure. Which was really convenient because the day before the Nail Challenge theme was announced, I had just painted my nails a French manicure. How ironic! Here’s the link to the page with all the entries for the challenge. Check them out! They’re amazing! Mine are about half way down. 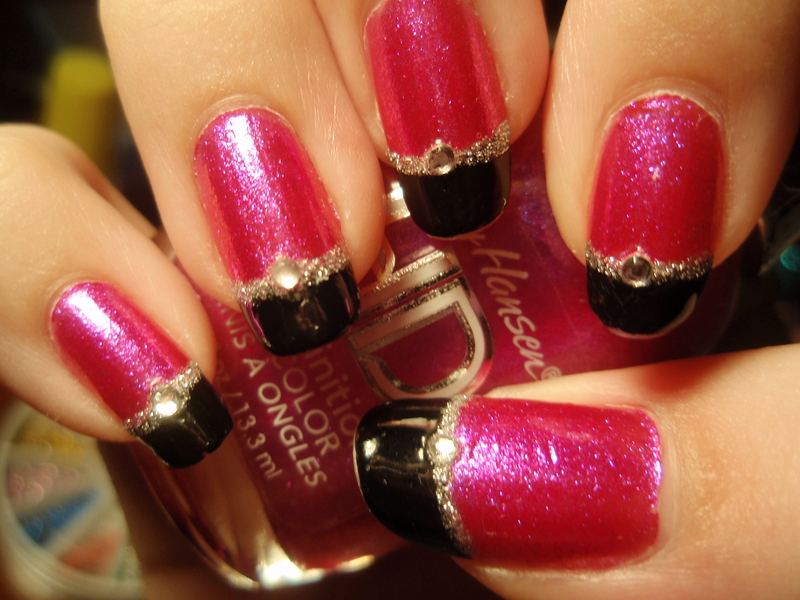 Okay, so let me explain how I did these. The second design was really quite complicated. And I hope I can put it into words. So, first off, I used the same base color as the first photo; “Sweet Blush” by Orly. Now, there’s a little background story to the design on the tips. This is what happened. I bought a purse from Lucky Brand and in the purse there was stuffing made of what can really only be described as paper mâché. And on the paper, there were pretty designs on it. 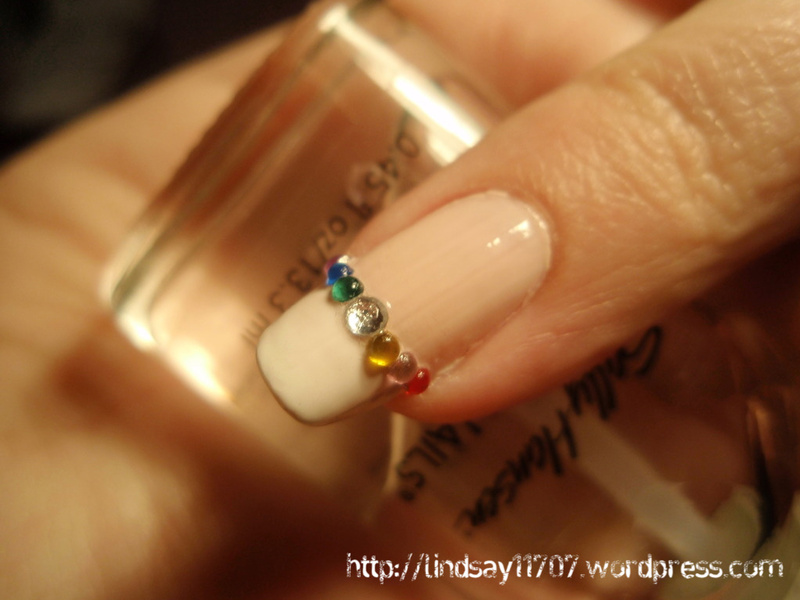 And I thought, “how cool would this look on my nails?” SO. 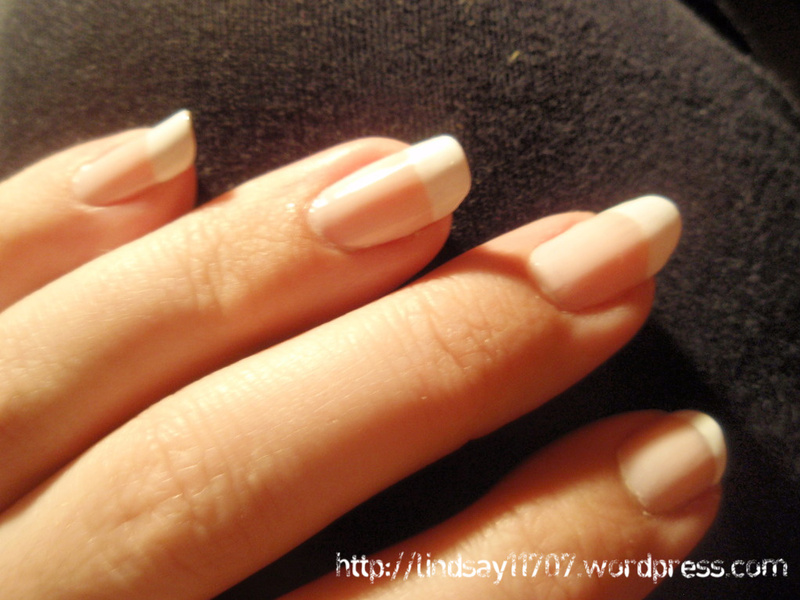 I cut little pieces of the paper and then cut a side of those pieces into a nice curve, to fit along the curve of my nail’s tip, so it’s good to have the “Sweet Blush” still wet so you can just apply the paper, but you can also just add a clear coat, but just on the tips of your nails. So I put on the paper, aligned the pre-cut curve, to my nail’s curve, and then I press it on using a wooden stick tool. 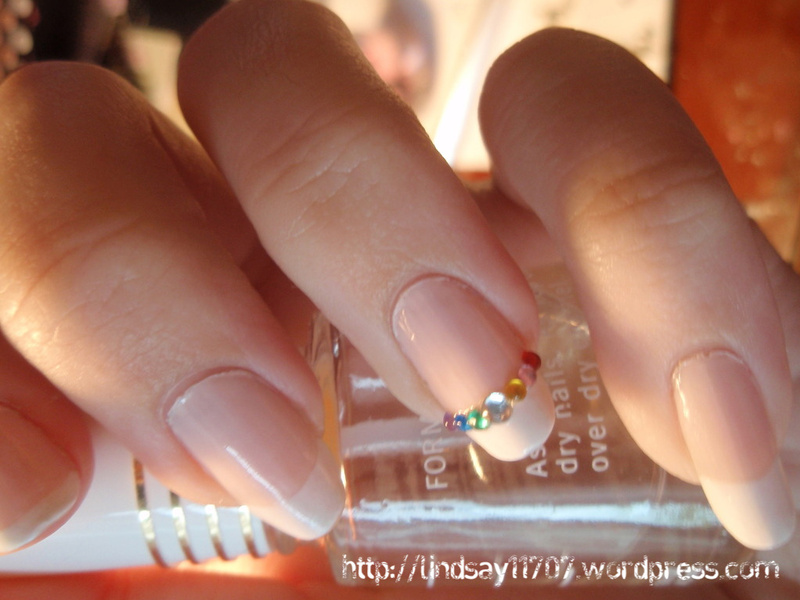 Then I folded back the extraneous paper under my nail and applied a clear coat over the entire nail. When it was semi-dry, I cut off the extraneous paper, and for the places that were too hard to cut with scissors, I used a nail clipper, as if I was trimming my nails. Then I just added a silver rhinestone and DONE. It was messy, and I had little pieces of paper everywhere. So I don’t know if I’ll ever do it again.